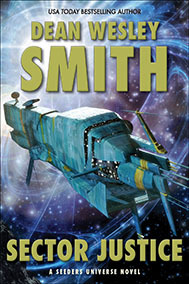 USA Today bestselling author Dean Wesley Smith returns to a not-so-distant future in his acclaimed Seeders Universe series. Mattie Silks must team up with the most unlikely of partners to save the sector from a ruthless dictator. Her only problem, besides saving the galaxy, comes from the man she must work with. She can’t keep her hands off him. And he can’t seem to keep his hands off her either. But with or without love, the two of them must save the galaxy.